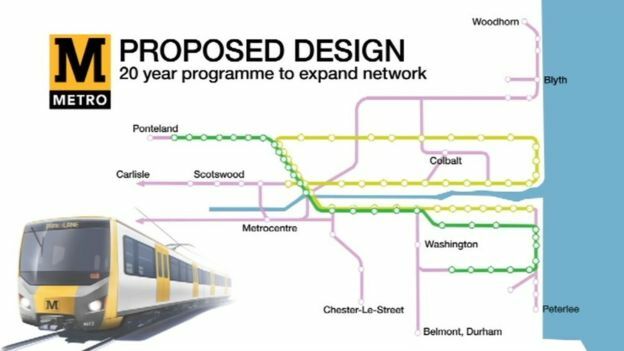 According to press material issued during July, a plan to extend the Tyne and Wear Metro and spend £1bn on new trains and the existing system has been agreed. Washington, Ashington, Peterlee and Gateshead's MetroCentre are among locations which could get a new Metro link. The North East Combined Authority said the proposals needed government investment to become a reality. The Department of Transport said it was already supporting Metro improvements and promised to meet passenger needs, although no commitments were forthcoming regarding the expansion proposals. Newcastle City Council leader Nick Forbes said the proposal was an "ambitious strategy for expansion". "Local rail brings huge economic and social benefits to the communities it reaches today, but we need to extend those benefits into new areas," he said. A network of disused or under-used rail routes across the region has been identified which could be used to extend the service using new trains. The proposal includes spending an estimated £1bn on the existing Metro system trains, infrastructure and signalling over the next 20 years. The new fleet is expected to be introduced in the early 2020s, Metro owners Nexus said. The company is talking to the government about the cost of expansion and its funding and will submit a detailed business case before the end of this year, it said. Combined Authority managing director for transport Tobyn Hughes said combining some local rail services with the Metro system on the same track could "create something new and better than the sum of those two parts". Without investment, trains and infrastructure would be "harder and harder to maintain" leading to increased failures, he said. Mr Forbes said the "well-publicised problems with train reliability on the system underline how essential it is to bring in a new train fleet". Metro operations director Chris Carson said they had put "robust" plans into place for this year's Great North Run after massive delays during and after last year's race. Local Metro, regional and national trains shared track for the first time when the route through Sunderland was opened in 2002. In a letter to the Chris Grayling MP, secretary of state for transport, Councillor Forbes has warned that there is an “immediate and pressing need” to replace the current train fleet. Throughout 2015 and 2016 we have reported a number of points failures, technical problems, power cuts, failed trains and overcrowding which have left passengers fuming. And the situation is only going to get worse unless the Government commits to invest £537m by 2021, Coun Forbes has warned. Coun Forbes said: “We are still operating the original trains from the late 1970s, which have already passed the end of their design life. "Train faults now create delays and disruption on most days, and our passengers’ patience is being tested to breaking point as the system, quite literally, grinds to a halt. The Metro was launched as a solution to Tyne & Wear traffic problems. The idea of joining up existing commuter lines and building tunnels under the city of Newcastle to avoid traffic was an excellent one. The trains have run successfully for many years but have never been a proper financial success as they need to be propped up by money begged from Government coffers. Funding for track upgrades and re-refurbishment of trains has been provided to keep the system running and now we hear that a further massive investment of £537 million is required, some of which is to expand the network but a large proportion is to deal with “immediate and pressing need” to replace the current train fleet. As a contrast, local bus companies continue to run their services as a proper business, carrying many more passengers than the Metro, making sensible profits, some of which are reinvested in new vehicles.